IISc PG admissions: Application process to begin from February 1, 2019. 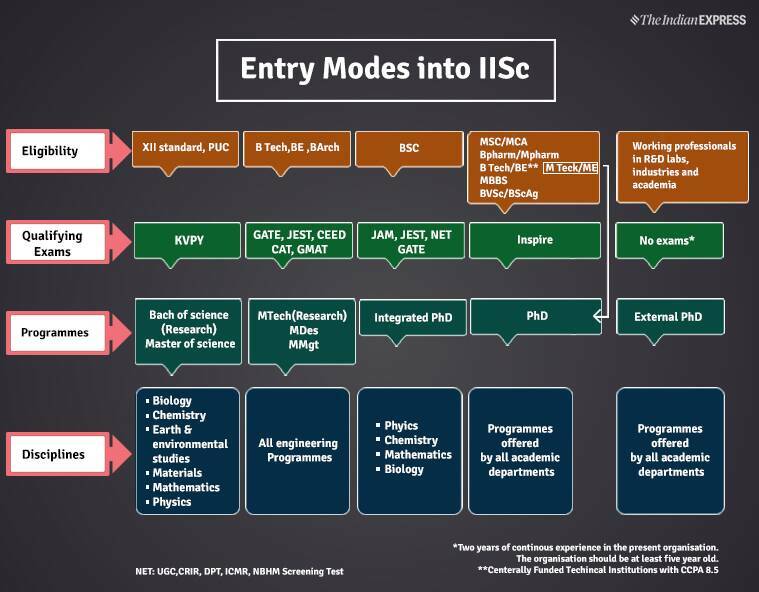 IISc admissions 2019: The Indian Institute of Science (IISc), Bangalore is inviting applications from eligible candidates to enrol for several courses at the institute. The courses on offer include research programmes – PhD, M Tech, course programmes – M Tech, M Des, M Management, Integrated PhD programmes and research under external registration programmes. For the research programmes, a PhD is a must. Applications will begin on February 1 and the last date to apply is March 25, 2019. The application link will be deactivated post 11:59 pm, March 25, 2019. Applicants possessing a bachelor’s degree in an appropriate field of engineering/technology or master’s degree in physical sciences, mathematics, statistics, geology, instrumentation, electronics, computer applications with a valid GATE 2017 / 2018 / 2019 score are eligible to apply. Particular eligibility for each course is different for each course/programme. The link will be activated only in February 2019. Candidates will have to pay an application fee worth Rs 800. For candidates belonging to SC/STPwD category the fee is Rs 400 and for ERP candidates it is Rs 2,000.